Medicine for Pimples, Dandruff, Constipation etc. Daily proper stomach clearance is the easy way to be healthy. But in complaints of constipation when we take laxatives, loose motions start which gives weakness.Instead of taking laxatives digest the food & clear the stools with waste is sign of good digestion. 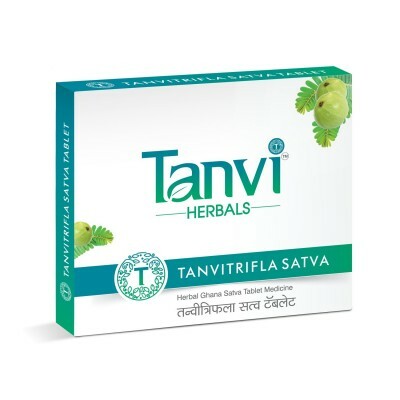 For this Tanvitrifla tablet is a mild laxative & liver tonic. Being concentrate, Tanvis small pinch size Tanvitrifla tablet is enough where 1 big teaspoon trifla powder is required. Powder gives nautiatic feel, vomiting & removes tounge taste. Instead of that everybody likes taking tyny Tanvitrifla tablet which is effective & concentrated treatment Without bitter taste & easy to use for all.Tanvitrifla tablet is an eye tonic on Eye pain, burning, blurr Vision, redish eyes, spects etc. on different eye complaints it can be taken with Tanvi Combinations.Scientists in BARC have proved that trifla herb is a best medicine on cancer. With chemical treatments cancerous cells, good cells are both damaged but with trifla only cancerous cells are damaged & health improves. Tanvitrifla Tablet is a herbal, natural digestive tonic which give good results without serious side effects so as an anti cancer tonic Tanvitrifla tablet can be taken for prevention. Tanvitrifla is a good treatment on various hair complaints like hairfall, dandruff, greying, allergies & infections etc. Tanvishataa 2, Vatshaanti 1, Tanvitrifla 1 & Wormex 1/4 to 1/2 tablet is oral dose & for external application Jaswand Joy 4 tsp & Keshkirti1/2 tsp mix with water. Make a paste apply on scalp. Wash off ofter 10 minutes. use once a week. Apply Keshbala oil for hair massage. In allergy, dandruff complaints apply pack of dandruffend + water once a week.For complaint of pimples, black patches, skin tannning daily take Tanvishataa 2, Vatshaanti 1, Tanvijyeshta 1 after breakfast & Tanvitrifla 1 after dinner. Apply once or twice a week pimpletone powder 1/4 tsp + water. For skin tanning complaint use Ubtan Joy, Papai Joy or Cucumber Joy 1/4 tsp on wetskin. Massage for 2 minutes & then wash off.In constipation, Indigestion take Tanvitrifla 1, Vatshaanti 1, Tanvijyeshta 1 after dinner. Take 1 to 4 Tanvitrifla tablets as required. This combination helps in fishers, piles, bleeding piles also.Those who suffer from acidity, burping etc. & have frequent headache do take tanvitrifla tablet with milk so it wont add acidity.Tanvitrifla is a combination of Amla, Harda & Behda herbs. Amla keeps human being everfresh & evergreen with strenth, stamina & vigour. So its a best tonic for todays age. So Tanvitrifla is todays best digestive tonic.As it works on lever disorders. Tanvitrifla can be taken as tonic in jaundice, hepatatis complants also.